During the fourth annual “Handy Hall and Friends Weekend” at Pine Forge Academy (PFA), the boys dormitory staff and dean debuted their new Ambassador Awards program. The program at the Pine Forge, Pa., based high school is designed to promote leadership, creativity and character development in African-American young men. “We want our young men to understand that it’s not just about having exposure to godly principles, but that they should learn to embody and showcase them to guarantee success,” says Jaymie Pottinger, head dean of the boys dorm. Read the 2016 May Visitor feature articles and the entire PDF here. Chesapeake Conference's Highland View Academy (HVA) in Hagerstown, Md., welcomes Erik Borges as their new principal, effective July 1. Borges has many years of experience as an educator and administrator. He transferred from California, where he has been serving as principal at Armona Union Academy since 2007. He has also interacted with students in the classroom and through athletics programs. Last Saturday Kettering College confered degrees and certificates on 244 students graduating with 249 majors at the school's 48th annual commencement ceremonies. The event was held at the Dayton Convention Center at 8 p.m., Frank Perez, CEO Emeritus at Kettering Health Network was the keynote speaker. College president Nate Brandstater granted 39 Associate of Science (A.S.) degrees in the following areas: radiologic technology (19) and respiratory care (20). Three certificates of completion in computed tomography, one in cardiovascular interventional technology, two in vascular interventional technology, and three in magnetic resonance imaging were granted. In his July 2008 Ministry magazine article, “Reaching Out: Making a Difference With Young Adults," A. Allan Martin, the teaching pastor of a young adult ministry at the Arlington church in Texas, cites Paul Richardson of the Center for Creative Ministry, with headquarters in College Place, Wash. Richardson reported that the median age for the Seventh-day Adventist community in North America, "including the un-baptized children in church families, is 58 … Among native-born white and black members, the median age is even higher." The frightening implications of this figure are seen when that median age, 58, is compared to the median ages of the United States and Canada, respectively, which are 36 and 37! The numbers are striking, but when the impact of extreme weather conditions on these particular populations are factored in, the number of people needing assistance can be staggering. Add to this people who are economically secure but have experienced an extreme weather event and are temporarily yet suddenly thrust out of their safe, stable environment. 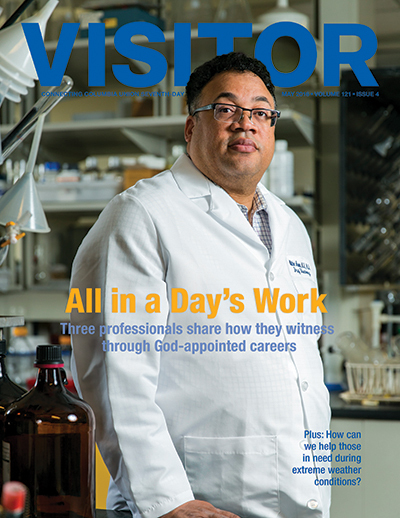 Three members share how they represent the Lord to the world around them—all while they shine in divinely appointed career paths. Hess’ goal was to be the vice president of his bank, One Valley Bank (now BB&T), before he was 30. He succeeded. In 1997 his uncle called to inform Hess it was time to buy his Virginia Honey Company, which he did later that year. Hess committed to give five cents of whatever sold to charity. Under his leadership, the company donated $1.5 million and grew four times. That was just the beginning of God’s path for Hess.